Rev. Rodney Sadler (far right, with water bottle) praying with protesters after the Keith Lamont Scott shooting. Martin Luther King used religion as a basis for his fight for civil rights. It’s happening again today with a slightly different focus. A look at religion’s role in addressing social justice. The nation just honored a man, a Baptist minister, whose life and legacy was devoted to the civil rights movement and racial equality in America. Dr. Martin Luther King Jr.'s work endures today as we continue to grapple with issues of race, racism and social justice. In King's tradition, local clergy are picking up the torch in confronting racial inequalities through nonviolent means. 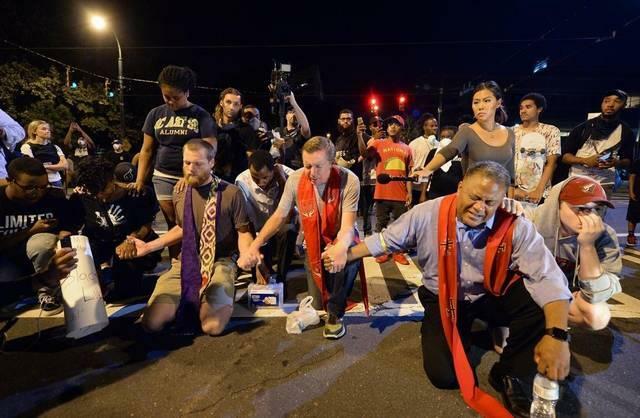 Church leaders in Charlotte were seen in the streets trying to keep the peace with protesters in the aftermath of the Keith Lamont Scott shooting. Tough conversations are happening among Charlotte congregations about where to go from here. Mike Collins will talk with some of the people involved in those discussions about the role of churches in addressing social justice issues and fostering conversations about race. Dr. Julia Marie Robinson - Associate Professor of Religious Studies at UNC Charlotte and Author of Race, Religion, and the Pulpit: Reverend Robert L. Bradby and the Making of Urban Detroit. She is also an ordained minister in the Presbyterian Church. Dr. Julia Marie Robinson will discuss her book "Race, Religion and the Pulpit" at 6:30 p.m., Tuesday, Jan. 24, 2017, at UNC Charlotte Center City. Details and registration. Myers Park United Methodist Church is exploring “Reconciliation With God And Others” in January and February. The series is open to the community. Details.